We index events from all around the Web, including ticket companies, booking agencies, record labels, and artists themselves. Data quality is extremely important to us! In addition, we give you the option to edit these events, and/or add additional dates through Bandsintown Manager -- either by bulk, or one-off dates. Our ticket links go directly from your Bandsintown artist page to the ticket company for fans to purchase. If you're using Squarespace, Wix, or WordPress, we have just the tools you need to easily integrate your events to your website. Click here. Finally, note you can link your YouTube videos to your event pages on Bandsintown to increase exposure, thanks to YouTube Cards. Bandsintown is where live music fans come to be notified of upcoming events from their favorite artists. Make sure your fans come and track you so they never miss another show! Add the Track Button to your website to convert website visitors into trackers you can engage with. Want to tell your fans how much you love them? Share exclusive content with them, like codes for VIP packages? You are preparing to announce new dates? Or want to share a throwback photo from your first tour? 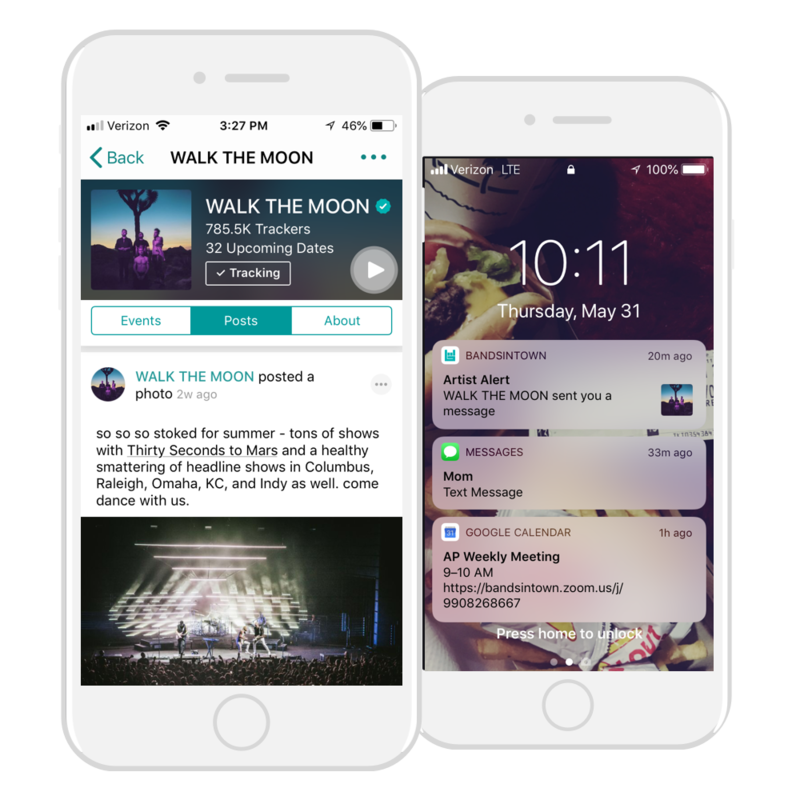 Use Bandsintown Manager to post all your messages and photos to your fans: all eligible trackers are notified immediately by email or mobile push notification. Use Bandsintown Manager to engage more specifically with fans who have RSVP'd to your events. Remind them to grab tickets for the show, or meet you at the merch booth ahead of your set, or scoop up your record after the set. Click on the Insights tab on Bandsintown Manager to get started. Our analytics tool helps you explore concert-going trends & assess fan demand by geographic location. You can find out how many viewed your messages and how ticket clicks are progressing, all in one place! Check it now (available to all artists with 100 trackers or more). Tour Date stats & more!